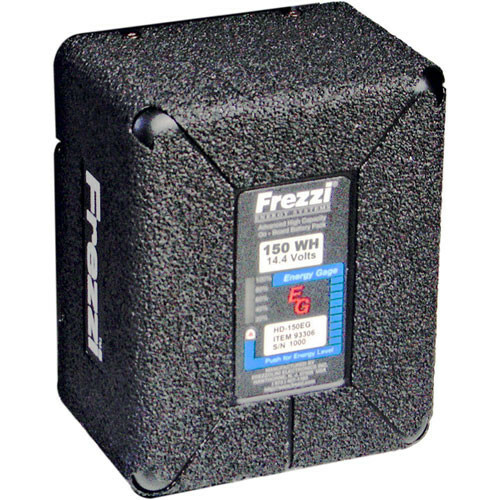 The Fezzolini HD-150EG 93306 is a 14.4 VDC 150 Wh NiMH (nickel metal hydride) battery with Energy Gauge. Video professionals around the world, recognize the alternative choice of the HD-150EG. The extremely high power output of the HD-150EG is highly recommended when powering a Mini-Fill on camera light MFIC and an HD camcorder simultaneously. The HD-15EG battery pack utilizes NiMH battery cells. NiMH cells do not experience voltage depression, eliminating any memory effect concerns. Unlike conventional cells that are stressed or damaged by fast charging, these cells are designed specifically for optimum life and performance. The HD-150EG is protected by an aluminum shell, high impact plastic case and rubberized coat protect the exterior from dents and dings; a thick shock absorbing internal padding protects the cells from impacts that would damage or destroy most conventional batteries. The "Standard" solid metal "H" design mounting studs assure a smooth, precise mounting to whatever equipment it is attached to. The HD-150EG will charge on most manufacturers brick-style chargers. The built-in advanced Energy Gage offers the operator an accurate and reliable indication of the available battery capacity. Box Dimensions (LxWxH) 7.0 x 5.5 x 4.5"